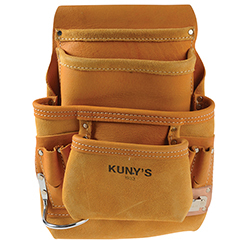 KUNY'S are a relatively new brand of Industrial Full Grain Leather products and Workwear Accessories and have been supplying the Carpentry, Electrical, Drywall, Forestry and DIY markets for more than 25 years. My Tool Shed stock a comprehensive catalogue of more than 100 of their top quality products including work aprons, tool belts, gloves, kneepads and belts. KUNY'S dedication in securing the very best grades of raw material in Leather, Nylon, Cordura, coupled with patented designs, produces comfort, strength and durability, which is the keystone across all of the range. Their products have been designed with you in mind. Packed with features and ample storage for the tools you need to complete the task. Plus, a selection of work gear to protect you at work, with knee pads and gloves with extra padding and heavy-duty construction to ensure comfort and ease of use. With practical uses and quality to last, explore the KUNY'Scollection now at My Tool Shed.